A great way to start your meal is with one of our appetizers. 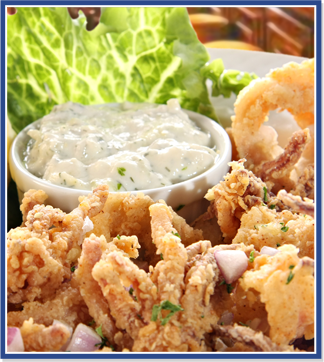 We recommend you try our popular Carolinian Fried Calamari. Fresh tender calamari fried in a light batter. Served with citrus garlic aioli and house marinara. Our most popular appetizer. Handpicked crabmeat delicately blended with aged Parmesan and cream cheese. Served with garlic herb toast points. 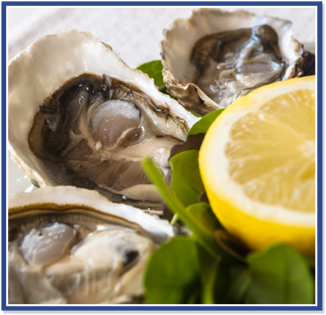 Six oysters on the half shell baked with crabmeat and spinach. Two flour tortillas stuffed with chicken, cheese and onions, then grilled and served with a sweet mango salsa. One-third pound chilled shrimp accompanied with house cocktail sauce. One-half pound of steamed shrimp seasoned with Old Bay. One cluster of steaming crab legs served with drawn butter. Shrimp, clams, oysters, mussels, one half pound of crab legs.